Health authority in the Baruta district of Caracas said Thursday 17 people were injured in clashes with Venezuelan riot police as protests are about to go into the fourth month. MEXICO CITY (Sputnik) — Baruta heath director Enrique Montbrun said eight people had suffered from exposure to tear gas, six had been hit by shrapnel and rubber bullets, while three had been injured by tear gas canisters being fired into the crowd. Separately, the Nacional newspaper reported that over 20 students were arrested and allegedly tortured by National Guard in the capital’s business hub of El Rosal. It said pro-government troops locked students in a truck a nd then threw a tear gas grenade into it. 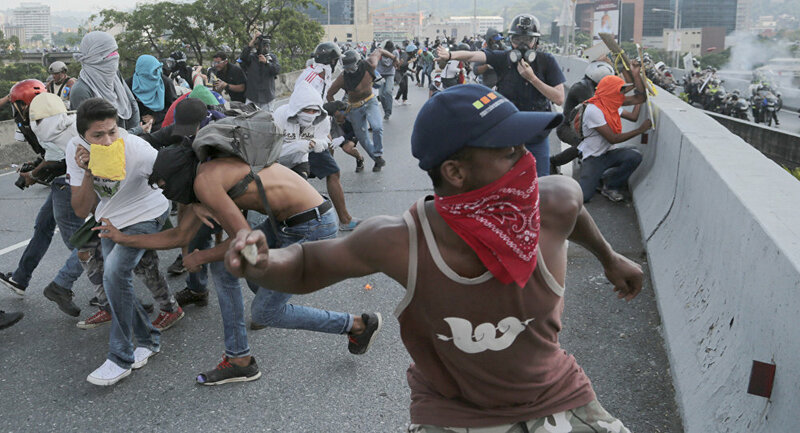 Almost 80 people have lost their lives during months of demonstrations against Venezuela’s embattled President Nicolas Maduro, prompting prosecutor general Luisa Ortega to describe the violence as state terrorism.